Lagan Valley MLA Jonathan Craig has said ‘justice must be done’ after the home of a man in his 90s was broken into on Monday night. At about 10.45pm on Monday, August 31, a man entered a house in the Ballymacash Road area of Lisburn and demanded car keys off the male resident, a man aged in his 90s. A while later, at approximately 11.10pm, the car was in a collision with a wall and was set on fire in the Distillery Street area of West Belfast. The car was destroyed in the fire. The resident was assaulted but not injured in the incident. 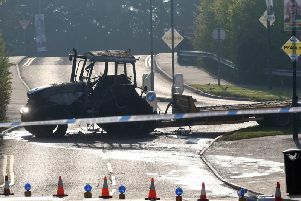 Lagan Valley MLA Jonathan Craig, who is a member of the Policing Board, has urged anyone with information about the incident to contact the police. “This is yet another outrageous attack on our elderly community,” said Mr Craig. “People who are vulnerable shouldn’t have to deal with this in their later years.